Where are the danger points? Some of the most dangerous fall points on roof tops are working near the edge, near access points, and around skylights. Injuries often occur because the worker loses their sense of just how close they are to these hazard points. They get absorbed in doing their job and simply fail to check where they are as they step to the side or backwards. Sometimes it’s a loss of balance or a stumble that sends them over the edge or into a skylight. The lack of handles on roof ladders and hatchways can lead to a fall during ingress or egress. Failing to mark off areas of limited weight support such as rotted or weak roof bracing can mean a fall right through the roof to floors below. Fortunately there are companies who take these dangers seriously and have developed some ingenious fall protection devices like tie-off anchors, perimeter safety fencing, skylight guards and warning line system. 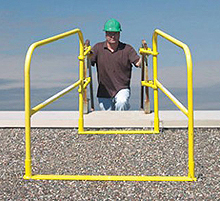 Others have considered ingress and egress hazards and developed handrail and barrier systems for ladders and hatches. These devices help you stay compliant with OSHA labor safety standards for both workers and contractors and should be a part of your safety plan. 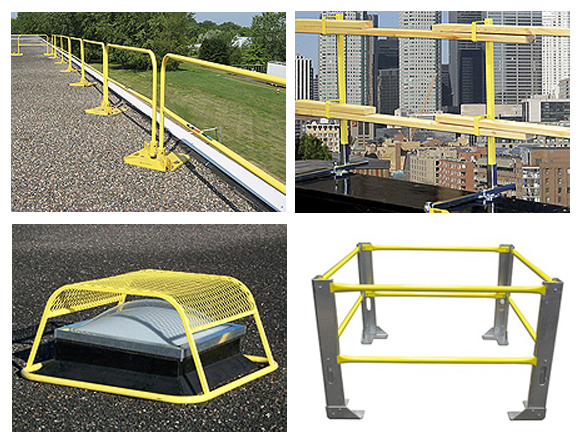 If you contract for roof work, require your contractor to set up safety barriers if you don’t have them on hand. It’s a great feeling to spend the day up on the roof where you can see for miles, but it’s only great when it’s accident-free. Make sure your workers and contractors come down off the roof in good health and physical safety – require the use of rooftop fall protection measures and assure your incident record at OSHA stays in great shape.